"The Magical Number 7, Plus or Minus Two"
Regrettably for most of us in our busy, action-packed lives, once a piece of information enters our head, it doesn’t immediately get stashed away in long-term memory. Rather, it exists in a temporary limbo, in what’s known as working memory, a collection of brain systems that hold on to whatever is rattling around in our consciousness at the present moment. 3. limited methods for encoding (primarily acoustic or visual). Visualizing the shapes of the numbers themselves may appeal to a small portion of the human population, those with analytic minds or who have a strong affinity for numbers (they may visualize colors associated with numbers, or assign personalities to digits). Most people, however, remember those seven plus-or-minus two numbers by repeating them over and over again to themselves in the “phonological loop,” which is just a fancy name for the little voice that we can hear inside our head when we talk to ourselves (There is nothing wrong with talking to yourself; it's even okay to answer yourself. It's when I see you arguing with yourself that I start to worry . . . ). The phonological loop acts as an echo, producing a short-term memory buffer that can store sounds just a couple seconds, if we’re not rehearsing them. The phonological loop or "voice" is "chunking," a surprisingly down-to-earth term in scientific circles for remembering a series with multiple parts. Because many scientific ideas, terms and methodologies are long and complicated, students can apply the principle of chunking to learn and remember the information. Chunking is breaking down large portions of information into smaller pieces, so they can be analyzed, processed and retained. Chunking is a way to decrease the number of items you have to remember by increasing the size of each item. Chunking is the reason that phone numbers are broken into two parts plus an area code and that credit card numbers are split into groups of four. Notice that the process of chunking takes seemingly meaningless information and reinterprets it in light of information that is already stored away somewhere in our long-term memory. The brain best remembers things that are repeated, rhythmic, rhyming, structured, visually striking, or connected to something we already know. Chunking makes use of combinations of these memory hooks to be effective. Mnemonics, from the Greek “mneme” for memory, are memory aids which make it easier to store information in your long term memory and recall it accurately on demand. My Very Educated Mother Just Served Us Nachos. While there are many traditional or well-established mnemonics for some fields of study one way to make a mnemonic relevant to you, the one doing the memorizing, is to make it significant to your own experience. Using your own interests, vocabulary, perspective, and outlook (humorous, serious, bizarre) makes it more likely you will remember it. The Major System was organized by German professor Johann Just Winkelmann around the end of the 1600s. This mnemonic system is based on the substitution of digits with language sounds, and may have been based on earlier systems devised by earlier writers. With this technique Winkelmann represented long numbers with sound sequences. For the number you want to remember you find corresponding letters which you turn into a word. To get the word you have to follow a few rules and use your own creativity as well, so the words you choose will be meaningful to you. 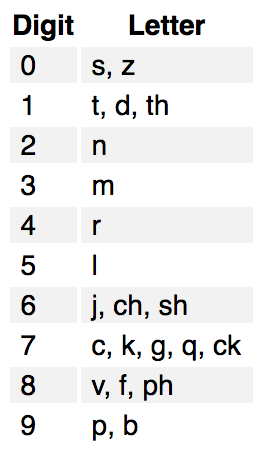 Consonants get substituted by the table. Vowels are added by the memorizer to create an easily-remembered word. Using the first choices suggested by Professor Winkelmann, we have the letters STLT. That is not much better than 0151! Adding vowels: Here is where your own creativity or interests come in--STLT could be SaTeLliTe, or satellite for a space enthusiast, or STiLTon, Stilton, a type of cheese for someone who likes snacks or the Adventures of Geronimo Stilton book series, or even SToLe iT, stole it, for someone worried about the theft of their bike and who needs to remember to lock it up with 0151. The phone number from the National Geographic Brain Games video: 432-517-1689. ​RMN LTK TCh VP, giving us the story "Roman Let K Touch Up." Since Professor Winkelmann's native language was German and he studied Latin and Greek, the letters and sounds he used may not be as common in your own native language and the words you frequently use. The Major System has had several revisions from different people over the last 300 years, thus the digits are matched with a few possible consonants, digraphs, or blends today to appeal to different language speakers. The key for using the Major System successfully is to select the digit-to-numbers paring that works best for you and use it consistently. Some students play with reversing the table to convert words and names into numbers as well. Some people with more analytic minds and an affinity for numbers may find it easier to remember names of people they meet as series of numbers!